A £6m contract is on offer to further extend Superfast Broadband across South Yorkshire in order to make fibre broadband available to as close to 100% coverage as technically possible. 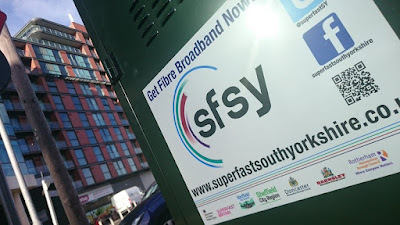 Superfast South Yorkshire is a partnership between the authorities of Barnsley, Doncaster, Rotherham and Sheffield and BT, which secured £22m to ensure 97.9% of South Yorkshire had access to superfast broadband by the end of 2017. Securing additional funding, plans are in place to reach 98.7% by 2018. In December, the Government confirmed that universal high speed broadband will be delivered by a regulatory Universal Service Obligation (USO), giving everyone in the UK access to speeds of at least 10 Mbps by 2020. BT had previously offered to deliver universal broadband through a voluntary agreement but this is not being pursued in favour of providing a "legal right" to broadband. The Chancellor announced at the Autumn Budget that local bodies could start applying for funding from the Local Full Fibre Networks (LFFN) Challenge Fund. The aim of the fund is to help locally led projects across the UK leverage local and commercial investment in full fibre. South Yorkshire is already targeting the estimated 30,000 premises in South Yorkshire that will be without broadband up to 30 Mbps when phase 1 of the Superfast South Yorkshire project is completed. The latest tender again shows a gap funding approach as the partners look to procure a wholesale broadband network solution that retail service providers can use to provide business consumers, residential consumers, and public sector organisations with a range of broadband services for the term. A new intervention area is being confirmed and the tender document states that the key aims are "to deliver business growth and new jobs, deliver a range of social benefits across its rural and urban communities and support delivery of public services through digital channels." Successful bidders are expected to provide substantial investment into the broadband network and must declare what investment it is prepared to make before the subsidy is applied. Rothbiz reported in December that the four South Yorkshire councils and the Sheffield City Region were planning on using £3.5m of National Productivity Investment Funding (the LFF Challenge Fund mentioned above is part of this fund) for the project. It would allow the councils to utilise transport levy savings to fund the financing costs of the £3.5m capital investment in broadband on a cost neutral basis.